Saolta University Health Care Group, the organisation which runs the local public hospitals, has reassured patients who have had appointments or procedures cancelled because of the nurses' strike that they will be contacted directly to re-schedule. The 24-hour withdrawal of labour by members of the Irish Nurses and Midwives' Organisation from 8am yesterday (Wednesday ) to 8am today (Thursday ) meant that only lifesaving and emergency response care was provided during this period. In a statement Saolta said many of its services were affected on Wednesday due to the industrial action. "The strike will end at 8am on Thursday, 31st January. This means that many of our services were not available [on Wednesday]. Patients whose appointment or procedure were cancelled will be contacted directly to reschedule." It warned however that the re-scheduling will affect the local hospitals' ability to treat further patients in a timely way. While emergency departments will be open during the strike, staffing levels will be reduced so Saolta advised people to expect delays. It asked patients to only attend its emergency services during the work stoppage "if absolutely essential". Local injury units will not be operational which will cause "further challenges" for emergency departments. The health care group said if subsequent days of action go ahead it will have a cumulative impact on waiting times and volumes. A spokesperson for the INMO warned if the dispute is not resolved there will be further 24-hour strikes on February 5, 7, 12, 13, and 14. The union outlined that the dispute centred on safe staffing in the public health service. "The HSE has not been able to recruit and retain enough nurses and midwives on current wages. The number of staff nurses fell by 1,754 (6% ) between 2008 and 2018, despite an ageing, growing population making the health service busier. 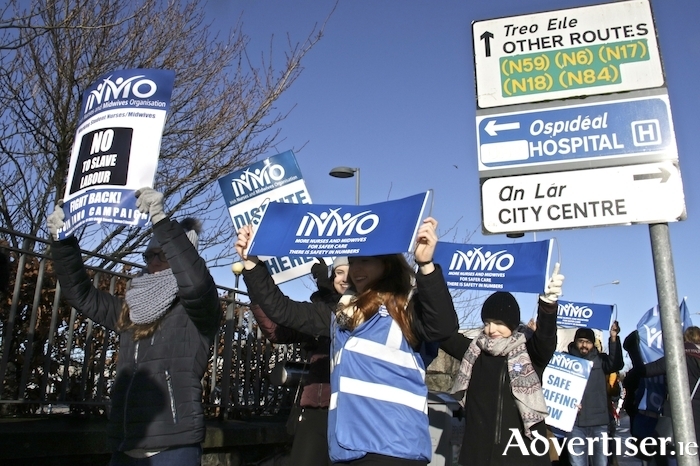 This is only the second national strike in the INMO's 100-year history." Going on strike is the last thing a nurse or midwife wants to do," stressed the spokesperson. "But the crisis in recruitment and retention has made it impossible for us to do our jobs properly. We are not able to give patients the care they deserve under these conditions. The HSE simply cannot recruit enough nurses and midwives on these wages. Until that changes, the health service will continue to go understaffed and patient care will be compromised. "The ball is in the government's court. All it takes is for the government to acknowledge our concerns, engage with us directly, and work to resolve this issue, in a pro-active manner. We were due to meet with the government in December, but the meeting was cancelled. Like many patients in Ireland's health service, we are still waiting for an appointment." The union said that nurses entered the profession because they care for patients. "Ireland's patients deserve better than this understaffed health service. Nurses and midwives are now globally traded assets. The public health service no longer pays a competitive wage, so we can no longer get the necessary number of nurses and midwives. We are calling on the public to support us. Nurses and midwives are always there for you when you need help. Now we need your help. We are immensely grateful for the outpouring of public support for Ireland's nurses and midwives and for the solidarity events by Irish nurses working overseas."